I recently bought several pieces of lovely vintage Uzbek ikat silk - "khan atlas" - and I just cannot take my eyes off them. 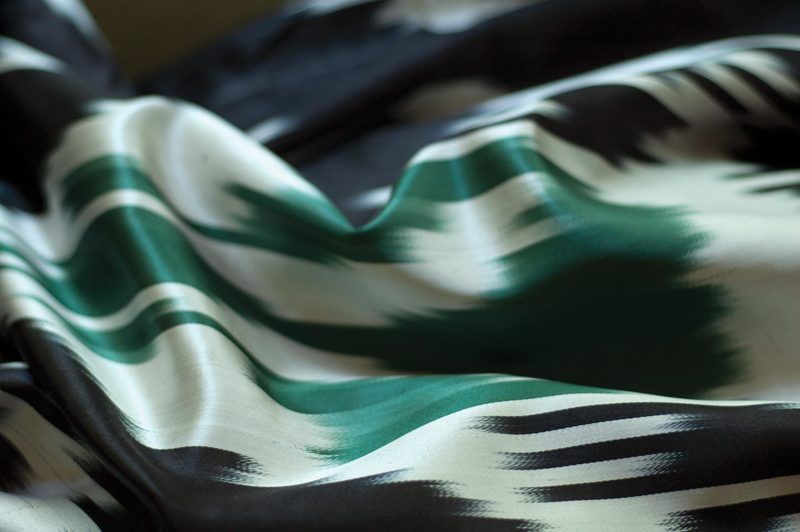 This lush, buttery soft fabric comes in many colors, but the pattern is always ikat (although sometimes you can buy plain undyed khan atlas but it is not found often). Just look at my new treasures! 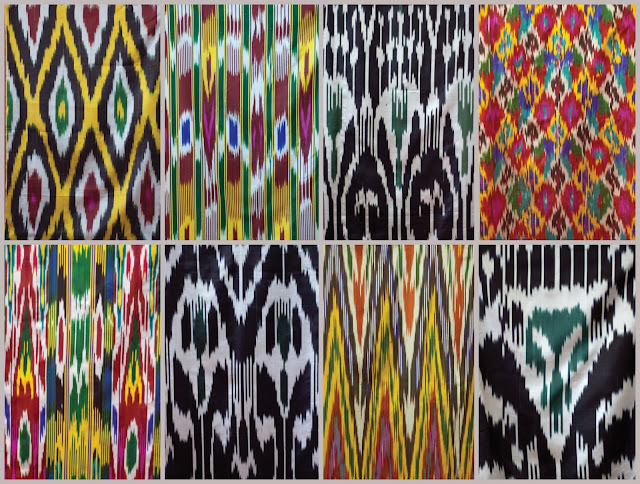 Sometimes Uzbek silk ikat reminds me of wild flowers. There is something botanical in these elongated lines and mixtures of earthy and bright colors. This simple combination of colors will look and feel chilly on the hottest summer day. It looks so natural, I think they used natural dyes there. I dubbed this one "my Renoir". The smaller elements in the design are considered highly desirable by the local people. When they offer you such fabrics, they always say: "Look, the ornament is so small! It is really beauiful and very chic!". The reason for that is, first of all, a greater complexity of the looming process. 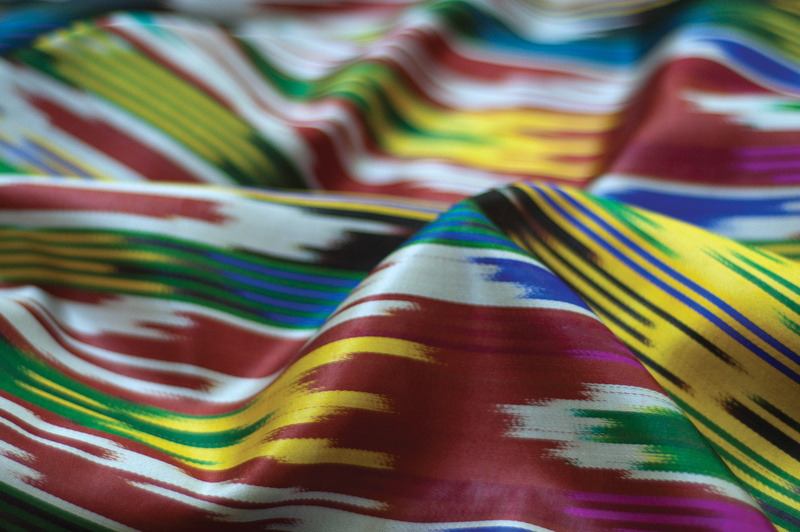 This design is not printed on Uzbek khan atlas; the threads are dyed in a variegated fashion, based on very complex calculations, so that when the silk is loomed, the design would appear. I think it is called self-patterning threads in knitting. So, naturally it is much more difficult to dye smaller sections in many different colors, rather than to dye threads for a large design in just three or four shades. Second, such design looks very flattering in a top, tunic or dress: it makes the wearer appear much slimmer (look here, for instance). This is another reserved color scheme. I love the combination of soft white, soft black and emerald green. And this piece of Uzbek ikat silk is crazy, in a good sense of the word. I know we are blessed to live in the silk heaven. 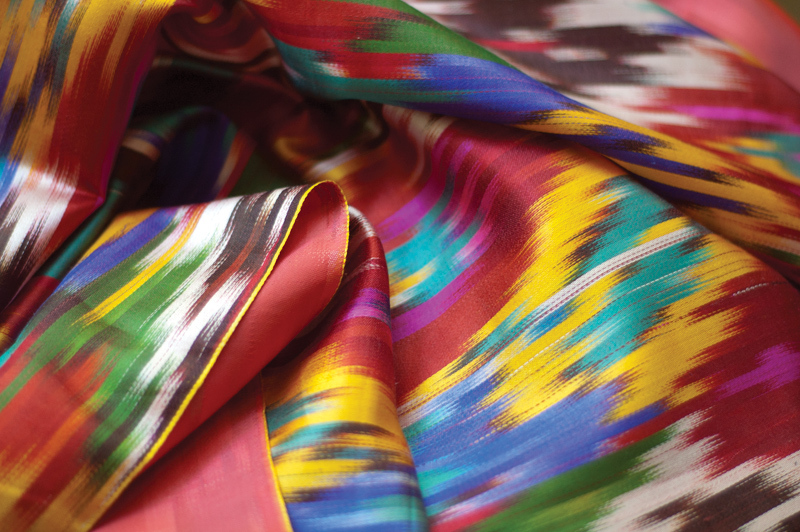 A small town called Margilan produces a sea of silk every year and has been doing that since ancient times. "The town is the location of Uzbekistan’s largest traditional silk factory, the Yodgorlik Silk Factory. Employing over 2,000 workers, everything is done in the traditional manner, for an annual output of some 250,000 square meters of highly premium silk cloth. Most of the silk I buy is vintage. 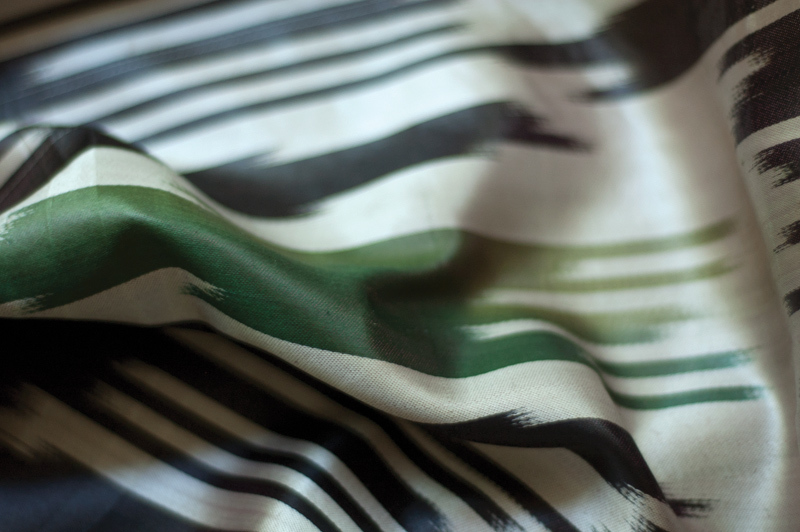 Strictly speaking, modern silk is not worse, and often it is difficult or impossible to see the difference, because they use old patterns and designs in the new factory, too. But in any case, we buy and use vintage fabrics whenever we can: they are beautiful, they are often rare, and I believe it is more environmentally friendly, even though we consume so little compared to the total consumption of Uzbek silk. Still, one little step is already something. Now we need to turn these luscsious fabrics into something wearable and I hope to be able to share the results of our work soon in our shop - MulberryWhisper.etsy.com. Женя, шикарные расцветки шелка. Мой фаворит на фото №3 яркое сочетание - "my Renoir", люблю вкрапления синего цвета. 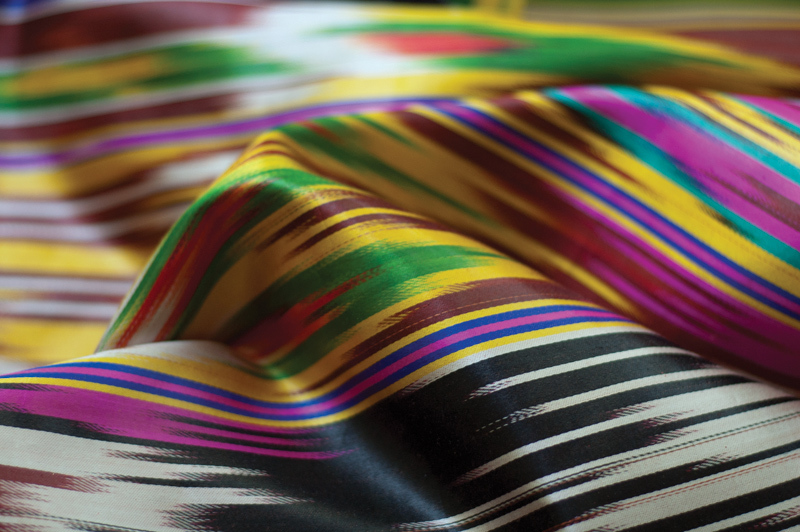 I would love to touch these fabrics! That must have the softest hand....it's definitely like a wildflower garden, perfect phrase. I love the bright colors and smaller patterns...so pretty! I do love the bright colorful style! Very pretty. OMG! So many pretty colors and patterns!